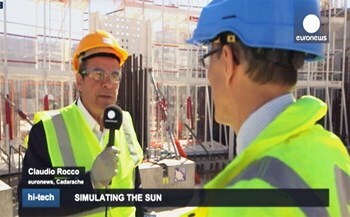 The Euronews documentary on ITER aired in 14 different languages on 29 April. Is fusion the answer to our planet's energy needs? This is the question asked in the five-minute Euronews documentary filmed last week at ITER and which aired on Wednesday 29 April in 14 different languages. ITER Director-General Bernard Bigot says "yes" and gives three reasons. First—the availability of fusion fuels. "With hydrogen," he says, "we have a source of fuel for millions of years to come." The second reason is that, although radioactive waste is produced by the fusion process, "the lifespan of the waste is very short—just a few hundred years, compared to millions of years in the case of fission." And third, fusion is intrinsically safe. Even in the improbable event of an accident, the Director-General explains in the documentary, "the quantity [of radioelements] released into the environment would allow the population living around the reactor to stay where they are and resume their activities." As for the cost of the ITER project, it must be viewed in relation to "the quantity or energy that will be produced" once fusion becomes an industrial and commercial reality. And that, says Director-General Bigot, "justifies the initial investment." View the five-minute documentary on the Euronews website in English, French, or 12 other languages.